The B-Dry EVO Rain Pant by CAMP is made for one thing – to keep you dry when its poring rain without weighing a gram more than necessary. 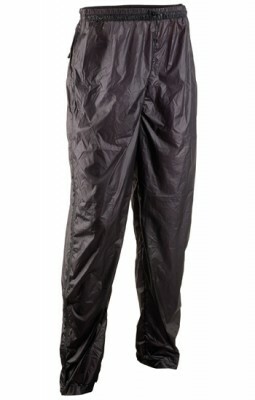 According to the manufacturer the B-Dry pants are made out of a ripstop nylon that “has a silicon treatment on the outside to shed water and add strength” as well as a “polyurethane coating on the inside giving it a water column rating up to 1500 mm”. While this thing isn’t going to breathe very well it will sure keep you dry and protect you from the wind. Many people prioritize breathability in their waterproof clothing but for a rain shell that isn’t something I’m so concerned about. I generally hike/skin in either the OR Salvo soft shell mountaineering pants or the OR Valhalla soft shell ski pants. These provide a pretty fair amount of weather protection. I’m only pulling my shell pants on when its REALLY dumping and those are times when I’m generally going to hunker down and wait out a storm. They feature full length waterproof side zips so they are easy to put on over ski boots or bulky mountaineering boots, an elastic draw string at the waist, Velcro at the cuffs and a zippered back pocket. One thing missing from the B-Dry pants is a built in stuff pocket. It includes a small stuff sack that you can use but I prefer to just stuff them into the back pocket and leave it unzipped to save that little bit of weight and make it less of a hassle to pull out of my pack. One thing to be aware of – I’m not sure how durable these are if you are doing some serious bushwhacking. I’ve used them backcountry skiing and clipped a few trees without issue but if you are pushing through a seriously think patch of spiky things you might do some damage to these pants (you might also want to reconsider your route…). With an overall weight of 136 grams (4.8 oz) the CAMP B-Dry EVO rain pants are always tossed in my pack, regardless of activity, and never regretted. This entry was posted in Activities, Alpine Mountineering, Activities, Backpacking, Brands, CAMP, Activities, Hiking, Gear, Pants, Product Review, Gear, Pants, Waterproof Shell.